Mr. & Mrs. Smith stars Pitt and Jolie as the titular couple, a seemingly banal set of suburbanites shielding their secret side careers as professional contract killers from each other. When the two are assigned to kill each other, an escalated series of attempted assassinations leads to restaurant confrontation filmed at Cicada in downtown L.A., followed by a firearms, fisticuffs, and fornication as the two rekindle their feelings and decide to team up. The slick black suit that Brad Pitt wore for this climactic sequence was only featured on the film’s official poster and most promotional artwork. Unlike the outfits worn by Pitt’s flashier characters in films like Fight Club and the Ocean’s Eleven series, John Smith’s clothing tends to be practical and accessible… just like one would expect from the suburban middle-class manager that John pretends to be. Solid black suits do not have much of a place in the business world, considered better for events like weddings, funerals, or a night on the town. John Smith ably wears his tailored black wool two-piece suit for the latter, paired with a white dress shirt and gray tie. Mr. and Mrs. Smith head for the dance floor. The single-breasted suit jacket has slim notch lapels that roll to the two-button stance, which John wears open throughout his time on screen. The jacket has a welted breast pocket, flapped hip pockets, and a long back vent. The shoulders are padded, and the long sleeves extend from heavily roped heads at the shoulders to four functional buttons at the end of each slightly flared cuff. The flat front trousers have a low rise, contributing to John’s laidback look as he glides out onto the dance floor with Jane. There is a straight pocket along each side seam and each jetted back pocket closes with a button. The plain-hemmed bottoms are left long, breaking well over his shoes. John wears a black leather edge-stitched belt. The closed buckle is polished steel with black horizontal embossing on the plate, perhaps signifying the belt’s maker. Anto Beverly Hills, a favorite of Brad Pitt in real life, likely made the white dress shirt that he wears in Mr. & Mrs. Smith. It has a narrow point collar, front placket, breast pocket, and back side darts. The rounded barrel cuffs have two buttons for an adjustable fit; when the sleeves aren’t rolled up to his elbow, Pitt wears the edge buttons fastened for a slightly larger fit around his wrists. John’s nice “night on the town” attire takes quite a beating once he gets home. Smith’s solid gray silk necktie was also likely made by Anto Beverly Hills, although the black back loop has no visible logo or manufacturer. All of John’s footwear is solid black, from his patent leather cap-toe bluchers and dress socks to the holster on his left ankle that holds his NAA Guardian backup pistol. In a way, Jane’s doing him a favor as having more than a pound of steel strapped to your ankle has to get in the way while dancing. When John first arrives at the restaurant, he shows up at Jane’s table wearing a black wool single-breasted overcoat with slim peak lapels and 5-button cuffs, but he quickly discards it. John surprises an aloof Jane with a refill of Dom Pérignon. After their brawl, John and Jane find themselves in their underwear for breakfast the next morning. Jane takes a Risky Business approach by wearing John’s white dress shirt from the previous evening, leaving John in only his white cotton v-neck undershirt and plain white cotton boxers. Some people just aren’t ready for life in the suburbs. John’s wristwatch is an IWC Pilot Chronograph IW3706 with a stainless 39mm case on a stainless 20mm bracelet. The watch has a black dial with white Arabic numerals, a 3:00 day-date window, and three black sub-dials. If you’ve got around $3,000 handy, you can pick one up for yourself online. With a fancy IWC wristwatch, you’d think John would be more focused on precision. Having removed his wedding ring, John’s only jewelry is the fancy gold cross that he wears on a thin gold chain around his neck. As he wears it under his clothes, the cross necklace is only visible when he and Jane answer their front door in the buff. 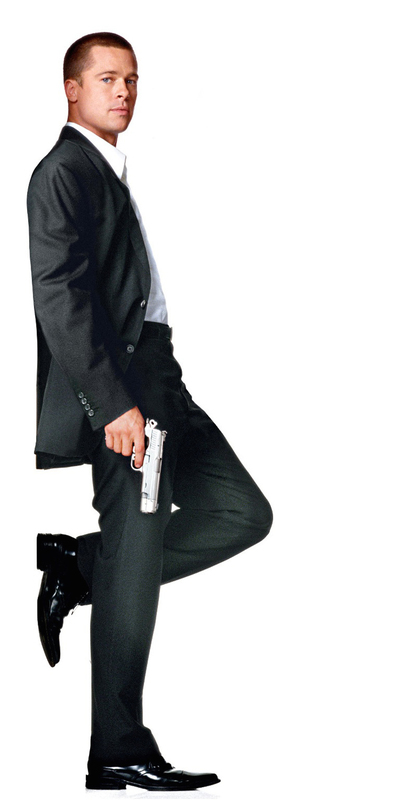 Brad Pitt, dressed in black suit and armed with a Colt XSE, as featured in much of Mr. & Mrs. Smith’s promotional materials. I’m sure it goes without saying that a black suit and silver tie ain’t gonna turn you into Brad Pitt… but a well-tailored suit with coordinated and correctly fitting accoutrements will certainly help you turn a few heads. Mr. & Mrs. Smith has a hell of a lot of guns in it, with each assassin owning a veritable arsenal of everything from subcompact .22 revolvers to customized AR-15 variants. When the time comes for their showdown, John races home to discover that Jane has cleaned out his arsenal. Like an alcoholic with that one old bottle stored away, however, John retrieves a game of Battleship and pulls from behind it… a customized stainless steel Colt XSE semi-automatic pistol, complete with sound suppressor. John finds tactical use for random household objects. 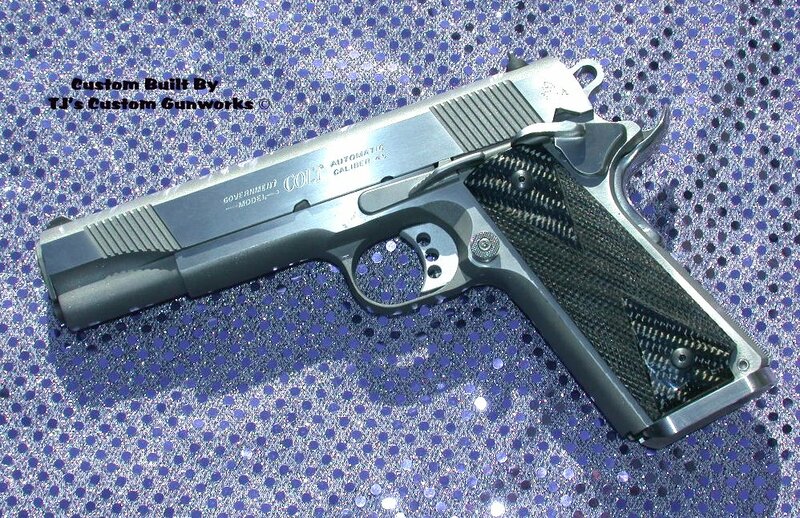 The Colt XSE is a modern variant of Colt’s venerable M1911 pistol, evolved from the “Enhanced” Series 80 model. Like its generational predecessors, the Colt XSE is chambered for the powerful .45 ACP cartridge and weighs just over two pounds with a full-size 5″ barrel. Elements of the original M1911 pistol – a long trigger and flat mainspring housing – join modern developments like an eight-round magazine, skeleton hammer, three-hole aluminum trigger, beavertail grip safety, extended ambidextrous thumb safety, and slanted front and rear slide serrations. The actual Colt XSE carried by Brad Pitt in Mr. & Mrs. Smith. You’d expect John to be armed and ready for a showdown when he confronts Jane in the restaurant, but she took advantage of his distractedness while dancing to remove the NAA Guardian semi-automatic pistol from his ankle holster. 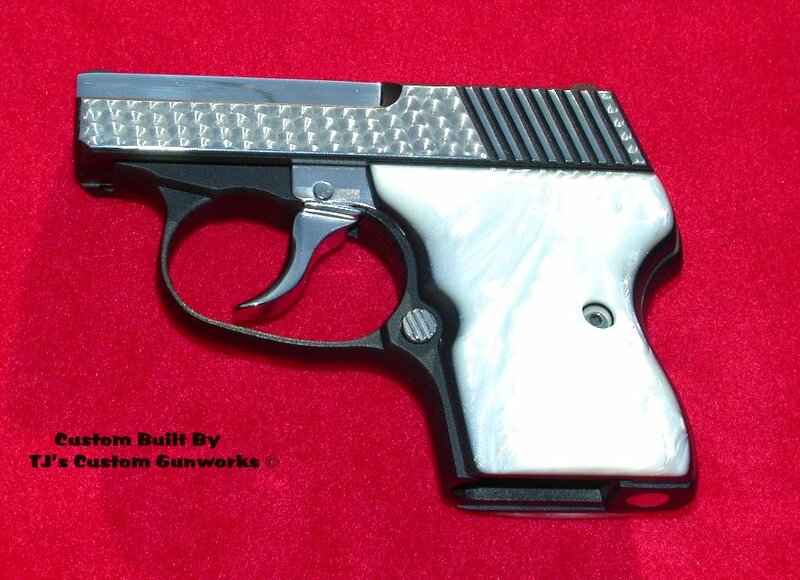 The NAA Guardian is available in a variety of small calibers, and John opts for a custom blued .380 ACP model with white mother-of-pearl grips. Despite its diminutive size – less than 5″ long with a 2.5″ barrel – the all-steel NAA Guardian weighs in at well over a pound. The trigger system is double-action only, and like many .380 pocket pistols, the NAA Guardian has a six-round single-stack magazine. The actual NAA Guardian carried by Brad Pitt in Mr. & Mrs. Smith. North American Arms offers Guardian pocket pistols through its site, with a standard stainless steel .380 model currently available for $456. Jane also carried her own NAA Guardian, albeit with black grips. For more information about the weaponry used in Mr. & Mrs. Smith, check out IMFDB’s well-researched page, which I used to find the above images of the guns actually featured on screen. The new curtains are hideous.